Most guitar players take reverb for granted, since it's built into most of the amps out there. But for a core group of players, reverb is serious stuff-no mere generic 'verb will do. From surf rockers to jazzers to country cats and alt-rockers, the holy grail is traditional spring reverb, found in vintage Fender units or a wide assortment of guitar amps. ToneCandy is trying to take that sound and put it in a compact pedal. 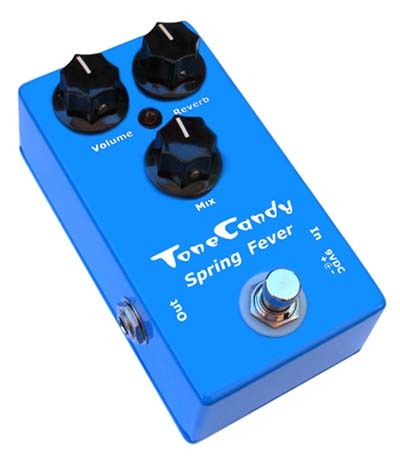 While there are plenty of reverb pedals out there, there are fewer that are handcrafted to the standard of the Tone Candy Spring Fever. The Spring Fever has a heavy-duty metal case, Switchcraft jacks and metal pots. All ToneCandy pedals are hand-assembled in the US with top quality components - a look under the hood shows a secure PC board and clean solder joints. The pedal uses hybrid circuitry; the spring simulator has analog and digital components to get the long decay while analog preamps in front of the simulator and another on the output "warm it up". On top, the pedal has a simple layout - there are single input and output jacks, plus a 9-volt adapter plug on the right side (which works with OneSpot and good quality adapters). Controls include a "true bypass" on/off switch and three knobs: Volume, Reverb and Mix. Using the pedal is straightforward - simply set the volume to the desired level, pick your reverb depth, and then use the Mix knob to blend the wet and dry signal. The Reverb control dials in the length of the decay, conjuring everything from plate to room to cavernous reverb tones. Using a Strat and an Ibanez archtop into tube amps made by PRS, Mack, and ValveTrain, it's fun dialing in a variety of surf-fueled sounds - and the Spring Fever covers all bases. One unusual effect happens when you set the amplifier pretty clean, but max-out the Volume and Reverb knobs with the Mix between from 2 o'clock to 5 o'clock. This created a swelling, distorted reverb sound that is spooky, fun and dramatic. The company says the Volume knob is a "transparent line boost that can give more gain if desired that works well as an end of a chain boost." No doubt, there are many interesting combinations of sound. Ultimately, the Spring Fever is tough, good-sounding pedal that does a fine job of emulating true spring reverb. It carries a boutique price, but you're paying for Sherman tank-level construction and deep attention to detail, aside from excellent tone. Certainly, you can get a cheap reverb pedal for a fraction of the price, but you won't get a true bypass signal or such warm tones. And because it's built for a lifetime, Spring Fever may be the last reverb unit you ever buy.